First printed during the crest of the women’s spirituality movement, the Motherpeace deck created a sensation as a multicultural tarot designed specifically for women. Depicting people of color, older women, children, animals, and balanced roles for men and women, the Motherpeace deck embraces images from ancient cultures and contemporary tribal peoples to convey the fundamental principles of cooperation, relatedness, egalitarianism, and ecstatic communion. 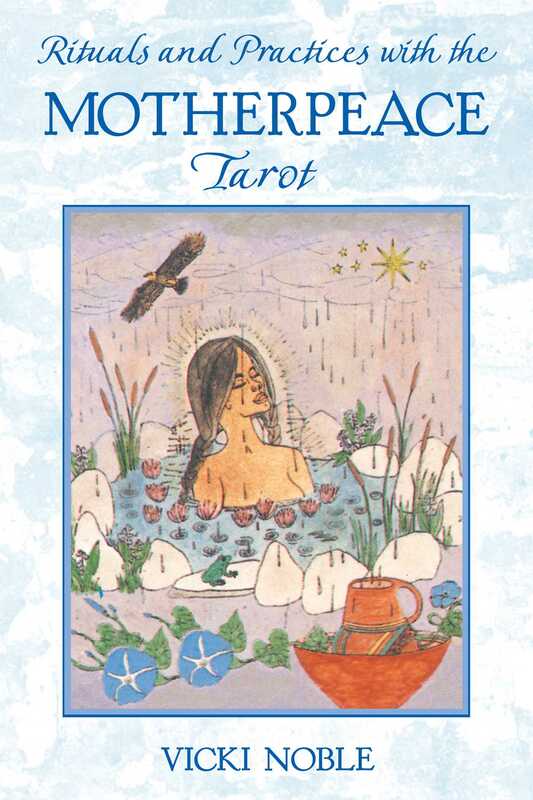 Rituals and Practices with the Motherpeace Tarot offers a deep spiritual practice that taps into and manifests the divine feminine through ritual readings, rites of passage, daily meditative practice, and seasonal celebration. Vicki Noble teaches how to use the imagery of the Motherpeace deck to read the past, present, and future; invoke good health on all planes; nurture healthy relationships; receive divine guidance during critical decision-making; and celebrate sacred holidays. Her book is a useful tool for both beginners and those with extensive knowledge of tarot. In the last chapter 1 discussed the difference between fate and free will and offered a reading layout for learning how to find a balance between the two. In this chapter I will go more deeply into the Major Arcana cards themselves and make suggestions on how you might handle the powerful influx of fateful forces and energies into your life. We are at a notable disadvantage in the West in regard to the so-called big energies because we cling to a rigid sense of our personal identities and our beliefs about the world. Historically Christianity has demonized the dark, invisible forces that earlier generations of Europeans took for granted, while scientific materialism denied that they existed. Westerners--and especially Americans--are the only culture in the world that denies the presence of the 'little people" or fairies, the intelligent consciousness of plants and animals, and the vibrations of the planets and stars. Through our cultural denial of such invisible, magical forces, we have habitually contracted our invisible energy bodies (often called auras) until they fit inside our physical bodies, isolating us and making it seem as if we are smaller than we are. Although our energy bodies are linked with our physical bodies, esoteric teachings tell us that they have the capacity to extend out from our physical bodies into the space around us, and ultimately to receive impressions from anywhere on the planet out into the universe, as well as engaging in interspecies communication. In the rock art and cave paintings of our ancestors on every continent, it would seem that these extended energy bodies were part of every culture's shamanistic or sacred woridview. Early traditions suggest that out-of-body experiences were common, and "shaman flight" was practiced by individuals for healing as well as collectively in ecstatic religious rites. In order to effectively handle the incoming transformational energies of certain Major Arcana, such as the Tower or the Death card, it helps to stretch ourselves and become more flexible--psychically, emotionally, and mentally--so that the changes that want to happen can take place with the least disturbance on the physical plane. Otherwise every transformative experience will be linked with bodily difficulties, such as accidents or illness, and outerworld shatterings (for example, losing your job, your mate, your house, and so on). There is a way to "dance" with the energies and forces, but it takes practice and a fluid sense of identity If the ego has congealed around a fixed or rigid sense of itself--that is, if you identify with or have become permanently wedded to who you think you are then you will experience an "ego death," which may be quite uncomfortable, even debilitating. Sometimes women are one step ahead in this process of spiritual development, because development of women's ego identities has in part been thwarted by Western culture, and there isn't such a rigid identity to let go of. But by the same token, it takes a strong sense of self in order to be fearless before the powers and energies of the invisible world. Often the process for women on the spiritual path involves on the one hand developing a creative ego, and on the other, letting go of ego patterns.You need to feel anchored to something solid or certain, something that is really there, in order to be able to let go into something. For those of us in Women's Spirituality, that something is the Goddess or the deep structure of the Mother, which we have learned to trust to safely hold us. When we let go of the enormous effort of holding ourselves together, we find that there is a safety net in the deeper psychic structure into which we have anchored ourselves through ritual.' This is the structure of natural law ruled by the Fates. The snake is also the symbol of spiritual energy, known as kundalini, which is pictured in yoga as a coiled snake resting at the base of the spine, waiting to be awakened through spiritual practices. However, this kundalini energy is spontaneously catalyzed every month during the bleeding time, creating a strong psychic experience for many women, even though we may not have known what to do with it! Over the course of a woman's life, there are many opportunities for such spontaneous awakenings of the kundalini energy; which is believed in India to belong naturally to women. The kundalini itself is often depicted or discussed as being a great snake who is a goddess, and when awakened, "she" rises up your spine through your chakras or energy centers, bringing cosmic consciousness and supernatural powers called siddhis. One of the most likely contexts for the awakening of "kundalini-Shakti"--the creative fire--is through the act of natural birth, which any midwife will attest to. Vicki Noble is a feminist, healer, scholar, teacher, and cocreator (with Karen Vogel) of the original round Motherpeace deck that has found its way into over two hundred thousand homes around the world. She is the author of Shakti Woman, Motherpeace: A Way to the Goddess, Motherpeace Tarot Playbook (with Jonathan Tenney), The Double Goddess, and The Triple Goddess Tarot. She lives in the mountains near Santa Cruz, California. "Will help every woman who enjoys tarot to grow as a woman, (and) progress in her spirituality." "Encourages active and balanced thinking towards a problem."